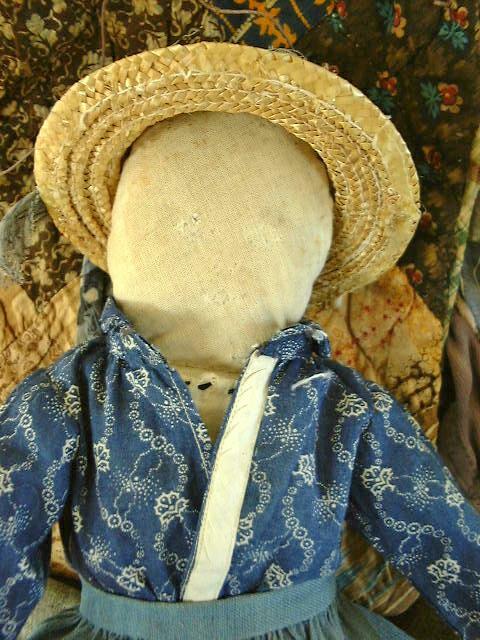 Old cloth doll dressed as she was found. Great early treadle sewn calico blouse and a solid blue skirt with nice detailed hand sewn feather stitching at the hem. She is simply made from old cotton cloth, appears to have had some embroidery to face and maybe a bonnet or hair was stitched to her head, now long gone. The back of her head has a seam. I'd estimate around 1910-20s when made but I am no expert. Measuring 14” tall. She feels stuffed with cotton batting. Her arms are sewn at the shoulder so they move up and down. Her hand has a little fraying at the tip. Her clothing is early but her hat is not, it shows some glue areas. A piece of fabric from an early rag ball was added as a band. Her original outfit is simple, blouse made of cotton and skirt possibly a wool. All show some fading, moth bites, pin pricks and worn thru slightly. She has a separate romper underneath made of a cotton gauze with some basic stitches to it. Sewn on long black socks show holes. 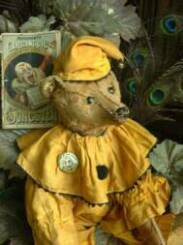 She is flexible and can easily sit, is handstitched in areas and comes in “as found” condition.